The famous Jeep got its start in Toledo, Ohio, during World War II. It was designed and built as a general-purpose vehicle for the United States military. Differing theories exist on where the 'Jeep' name came from (possibly from 'Eugene the Jeep' in the 1936 Popeye cartoons, or from shortening 'general purpose' to 'GP' and then to 'Jeep'). Regardless of etymology, the Jeep was the beloved four-wheel-drive reconnaissance vehicle of the United States Army. The first civilian Jeep (CJ) was made in 1945. The company that made it, Willys, was sold several times over the century (to Kaiser Motors in 1953, to American Motors Corporation in 1970, and finally to Chrysler in 1987), and the vehicles have been built under license at various locations around the world (India, Spain, Japan, China, and South America). AMC replaced the Jeep CJ-7 with the Jeep Wrangler. Responding for demands for SUVs in the middle of this decade, Chrysler began emphasizing on-road performance over off-road capabilities in newer Jeep models. A 2006 road test of the SRT-8 Grand Cherokee resulted in 0 to 60 mph in 4.6 seconds and a quarter-mile drag of 13.2 seconds at 104 mph. This made it the fastest accelerating vehicle in the SRT8 lineup, beating the Chrysler 300C, Dodge Charger, Dodge Challenger, and the Dodge Magnum. The history of high-performance SUVs isn’t very long, but the successful ones have been triumphs of engineering over the SUV’s unpromising dynamics. 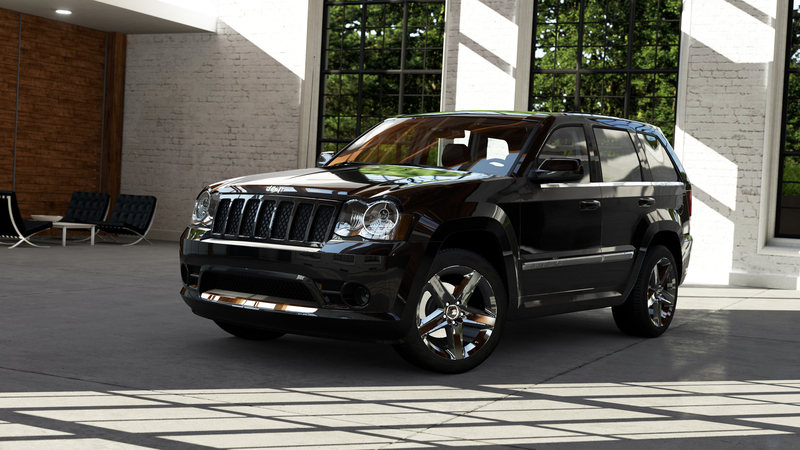 Of all that have made it past the drawing board into production, few are as good as the Grand Cherokee SRT8. Perhaps that’s not surprising—the original Grand Cherokee was a seriously fast vehicle, and not just for an SUV. So when the SRT team set to work on the third generation vehicle, the groundwork was already there. In addition, they had access to the 6.1-liter Hemi, one of the greatest modern performance engines around and a staple of the SRT lineup. Now, it’s easy to imagine the Grand Cherokee SRT8 as a one-trick pony, quick in a straight line but bumbling in a corner. While the speed is certainly there (60 mph flashes by in less than five seconds), the Jeep’s likely to surprise you when the going gets twisty, because their engineers massaged the suspension, fitted much larger brakes, and stuffed massive rubber under the already arched fenders. And with the revised front air dam and the rear bumper (sporting massive center-exit exhaust pipes), no one’s going to mistake this for a normal SUV.